Well, I have made absolutley no progress with Mrs Dalloway, having been sidetracked into a much more enjoyable re-reading of Catherine Fisher’s Oracle trilogy. 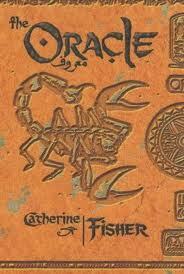 (The Oracle, The Archon, The Scarab). I love Catherine Fisher’s books for the way they re-make myths, sometimes setting them in a contemporary world, sometimes framing them in a new fantasy world. This trilogy blends aspects of ancient Greece and the Egyptian worship of the dead into something completely new and wholly itself. If you enjoy fantasy and haven’t come across these, I can’t recommend them highly enough. My own writing life has been enjoyably busy lately. I’ve been editing my new Fife-set novel (Dark Spell) and my new non-fiction book on DNA (What Makes You YOU? ), both of which come out next year. I’ve also been looking at cover designs for these and for the new picture book (The Giant Panda Party), also due out next year, and for Chaos Clock and Chaos Quest, which are both being re-jacketed. So in effect you’ve got FIVE books coming out next year?!?!? Green-eyed monster, get thee behind me! No, not 5, just 3 (!). The other two are just being rejacketed. Still, they look like new! So you’ve got THREE books coming out next year?!?!? Green-eyed monster, get thee behind me!